February 25, 2014 - Early booking numbers for Cape Cod, Martha's Vineyard and Nantucket vacation rentals this summer indicate positive gains over the same period last year. But the significant increase in weekly pricing of the homes listed on WeNeedaVacation.com's vacation rental website marks the largest the company has seen in its 17-year history. Below are some of the highlights of the company's recently released, comprehensive 2014 Pricing Report, which was prompted by this significant finding. Overall, for the full 2014 spring/summer/fall season, and for the entire Cape and Islands region, bookings so far are up an average of 4.8% from the same period last year. The Cape is up 5.5%, Martha's Vineyard is up 5.8%, and Nantucket is actually down a bit at -1.1% (probably due to the fact that Nantucket bookings this time last year were up nearly 20% over the previous year). 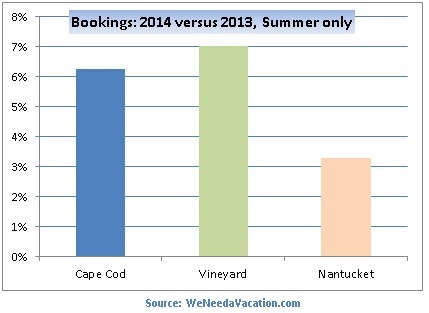 For the high summer season alone, though, the booking numbers are even stronger, up nearly 6% for the entire region, including the Cape up 6.3%, the Vineyard up 7%, and Nantucket actually up 3.3%. Bookings for the spring (Memorial Day Weekend to June 20) are responsible for bringing those full season numbers down somewhat as spring bookings have slowed a bit, overall off -3.4% at this point from last year. But mitigating the softer numbers from the spring are the fall bookings, which are, once again, posting significant gains, already up over 16% from last year. 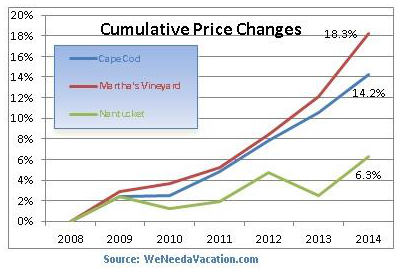 Weekly prices on the Cape are up 3.3%, Nantucket 3.6%, and the Vineyard a record 5.5% over last season. These numbers may not seem especially remarkable - until they are put into historical perspective. During the few years following the poor economic climate of 2008-2009, Cape and Islands homeowners raised their weekly vacation rental prices only moderately, if at all. Since 2008, the average compounded growth per year was only between 1% and 3% (2.2% for the Cape, 2.8% for the Vineyard, and 1% for Nantucket). Thus, in contrast, the rate increases this year of 3.3% for the Cape, 3.6% for Nantucket, and 5.5% on the Vineyard are impressive. What impacts pricing the most? In addition to offering popular amenities, of course, three of the most influential factors impacting rental prices are region/location, number of bedrooms, and proximity to a beach or the water. Pricing vis-à-vis region: The average weekly price of a home on the Cape this year is $2,737, vs. $3,636 on the Vineyard, and $4,800 on Nantucket. During the pre-recession season of 2008, Vineyard rentals were 28% higher than the Cape and are now up to 33% more. Nantucket prices, on the other hand, have dropped from 88% higher than the Cape to only 75% higher. And when comparing the Islands to one another, Nantucket is now only one-third (32%) more expensive than the Vineyard, whereas in 2008 its prices were as much as 47% higher. Pricing vis-à-vis number of bedrooms: The average price per bedroom varies somewhat depending on how many bedrooms there are and, of course, where the home is located. But one-bedroom homes command the highest per room prices, followed by 5-6 bedroom homes. The 3-4 bedroom homes seem to offer the best per-bedroom value. Pricing vis-à-vis distance to a beach: Regardless of the region or size of the home, however, perhaps the biggest determinant of pricing is a home's proximity to the water. In our 2014 Pricing Report, we compared homes that are within ½ mile of a beach or water to those that are not (what we call "inland"). We discovered that homes that are within walking distance of a beach are generally priced an average of 20% higher than their inland counterparts, homes set directly on the salt water (no beach) are 43% higher, and those located directly on a saltwater beach are priced 104% higher. Naturally, this year's pricing indicates a marked growth in confidence on the part of our homeowners. And, given the healthy booking numbers so far this season, it doesn't appear that their confidence has been misplaced. The booking season is still young, however, and we will continue to monitor booking rates carefully throughout the year. Despite the recent price increases, Cape and Island vacation homes continue to be a very affordable lodging option for vacationers, especially for families. With over 3,500 active listings, vacationers are able to find a home on WeNeedaVacation.com that meets their budget needs and also allows them the benefits of added space, privacy, and self-sufficiency. About WeNeedaVacation.com: Since 1997, WeNeedaVacation.com has been providing an efficient and inexpensive way of matching vacationers and vacation rental homeowners. The website lists more than 4,000 properties on Cape Cod, Martha's Vineyard, and Nantucket. The WeNeedaVacation.com Vacation Planner also offers extensive information to the 175,000+ vacationers who use our site yearly, including information about beaches, events, dining, activities, and shopping. Our amazing staff collectively has over 100 years of experience as Cape & Islands vacation rental homeowners. We love the Cape and Islands, work hard to promote this special place, and proudly belong to 17 local Chambers of Commerce.